Andy Shantz obtained his B.S. in Anthropology and minor in Environmental Biology from the University of Colorado, Boulder in 2005. After becoming interested in marine systems he enrolled in the East – West Marine biology program at Northeastern University where he studied coral-predator interactions in Moorea, French Polynesia while completing a M.S. in Marine Biology. He was a research technician in the Burkepile lab before joining as a Ph.D. student in 2010. For his dissertation research, he is focusing on the impact of nutrient pollution and the impact of different nutrients (nitrogen vs. phosphorus) on corals, coral reefs, and the ecology of mutualisms. Andy’s work has focused on how extra nutrients in the environment impact how corals photosynthesize, grow, and maintain partnerships with their symbiotic algae. 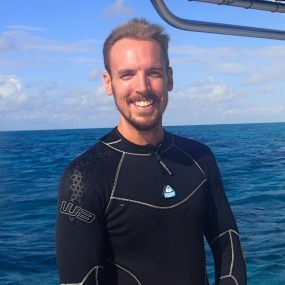 Other parts of his dissertation have focused on the role the fish-derived nutrients play in creating spatial heterogeneity on reefs and the impact of size selective fishing on herbivory and herbivore-algal-coral dynamics.